This page will serve to be a collective resource for our property managers, accountants, operations, and others.. Please “subscribe” to the page so you receive e-mails when there has been a change. Note that updates may be made to this page without other means of providing the same information. Meaning it’s very important you keep up to date with the policies below. JOB DUTY: It’s very important that property managers keep Buildium up to date in terms of lease expiration. There is an important distention between “rollover” and “fixed” when you see a lease set to expire (“rollover” has a curved arrow icon. “Fixed” as a calendar icon). “Rollover” means their lease is set to expire and when it does, it’ll simply convert to month to month. “Fixed” means that once their lease ends, they’re done. By default, most leases are set as fixed with rollover. The reason you’d change the lease to “fixed” is if someone gives you notice (or we give them notice). In that case, the date given is the date that Fat Property and the tenant know they’ll be gone. That change allows our leasing manager to know that the unit will become available. The reason the default is typically “fixed with rollover” is that will convert them into a month to month tenant at the end of their lease term rather than end their lease. The issue with “fixed” without roll over is at the end of a tenants lease, often a property manager would not contact the tenant or update them in the system. This would stop all rental charges from being placed on their ledger. JOB DUTY: Property managers need to view all their leases ending within 60 days and contact the tenants to find out what they’re going to do. Any lease with fewer than 45 days left will be “fair game” for our leasing manger to advertise and lease. Once (if) a new tenant is found, the existing tenant will be given a notice to vacate to match the desired move in date of the new tenant (NTV must be at least 30 days). JOB DUTY: A report is to be filed in your share drive, weekly, that shows the status of all leases ending in less than 60 days. The report should have notes in regards to proposed new lease. Each new report should be “pasted” as a new sheet in a new excel file. Instructions: In Buildium, go to “reports” then “leases ending“. The “FROM” date should be the date the report is ran. The “TO” date should be 2 months out. (example: If today is May 4th, then you’d run a report FROM May 4th, TO July 4th). The report generated will have almost all info. All you need to do is write notes after the last section. Ideally the copy would be a digital pdf that was via docusign, signed by both parties. However, for those tenants that can’t docusign, it can be scanned and put in the share. Note: There should be only one lease per unit number. When a new tenant moves in, the old lease should be moved into the “old leases” directory. JOB DUTY: It is the property managers job to make sure that the /leases directory has all leases for all current tenants. If you see one that’s missing, put it in your own shared drive and it’ll be moved into the correct directory. If after you’ve shared leases, you still notice that they’re missing, then inform operations that leases are missing from the proper folder and still in your shared folder. We are able to give a tenant a notice of rent increase at any time. The rent increase simply can’t kick in until their existing lease is completed, or 30 days from when notice is given (whichever is longer). Meaning if someones lease is set to end in 4 days (then they go month to month), you can’t give them a rent increase for the following month. If, for example, their lease is set to expire at the end of November, you’d need to give them notice of rent increase in October for it to kick in December. It’s best to provide a notice of rent increase towards the end of the month prior to the last month of their lease. If they are month to month, you can give them notice of rent increase at any time but it wont’ come into effect until the 30 days after the current month ends. JOB DUTY: Once you give someone a notice of rent increase it needs to be reflected in Buildium as a new reoccurring charge (which starts on the date their new rent kicks in). The old existing reoccurring charge needs to be modified to terminate after x more occurrences to make sure they don’t get charged twice (or not at all). If you’re sending them a notice of rent increase along with a request/offer to renew their lease, the rent increase STILL needs to be done in buildium. However, you’ll leave their lease end date alone until you have confirmation of the tenant of the new date. It’s very important that this policy is understood. If you have any questions about this, ask your supervisor as not following this policy will result in a reprimand. Are available for $50 over market rent. Charge 1 month rent if WE find someone to re-let tenants apartment. Charge 1/2 month if THEY (tenant) finds someone to re-let apartment. NOTE: Lease terms do NOT change and there is no need to make a new lease, simply add new tenants name onto current lease. They will be on this lease until it ends which is when they’ll need to be placed in a NEW LEASE. When doing a bank deposit, make sure the memo says “Deposit by (name)”. If cash was taken from the deposit to buy something, the receipt must be included as an attachment, it must be entered as another negative item, and a note ” – See cost” must be added to the “Deposit by…” memo. Note that using cash from a deposit should be done on a very selective basis and should only be done for an otherwise approved purchase. When doing a deposit, make sure to select all money in undeposited funds that is being brought in. It’s very important that the deposit being made in the bank matches 100% to what you’re telling Buildium. JOB DUTY: All funds must be placed into the bank within four days of receipt. There should never be funds “orphaned” or otherwise rotting in undeposited funds. All tenants, with very few exceptions, have rent due on the first. It’s late as of the second. Most leases have 3 day grace period before late fees kick in (most old leases have $25 late fee, new ones have $40. Both should have $10/day after). Buildium should automatically put a late fee in if rent is not paid on the 3rd. However, if payment is received on the fourth (either in person, or paid online), it’s up to the manager to confirm that a late fee has been applied. One way to help make sure they are charged is to pay attention to the daily ‘rent paid’ e-mails sent by Buildium. If you see someone paid on the 4th or later, view their ledger to verify a late fee was added. If not, add it (and work with operations manager to figure out why it wasn’t auto applied). Same goes for the $10/day fees. Another way is to run a “rent paid” report from the 4th of the month till today’s date. That’ll give you a list of late payers (ignore ones that are new tenants paying their first prorated rent or deposit) for you to verify that late fees have been applied. JOB DUTY: It’s up to the managers to make sure that tenants have proper late fees applied to their account. Management will run reports on their own to verify late fees are on the accounts of late payers. Missing late charges can be reflected against any commissions so it’s very important they’re on the ledger.. If you want to waive the late fee, it needs to be done as a concession credit vs. removing them. A property manager should NEVER remove a fee from a ledger. Rather, ask the operations manager to put the applicable credit on along with a note of why it’s being done. Note: If a late fee arrives due to our error (i.e., payment arrives before the 4th but we post it late), then the late fee can be deleted. This still would need to be done by the operations manager. Also note that if a payment arrives on the 4th but was mailed on time, it’s still late. Payment is considered received on the date it’s delivered — not the date it’s mailed. If a tenant wants to make sure to avoid late fees due to mail delay, they should mail it early or pay online. All property managers should double check to make sure that in Buildium their profile is set to receive email notifications when payments are reversed. This is to be done when payments are reversed for any reason (NSF, stop payment, bad account number, etc.) When they see this they are to AUTOMATICALLY place a NSF FEE on their ledger. DOUBLE CHECK THEIR LEASE TO VIEW CHARGE AMOUNT (rangers from 25 to 75) It can be under “NSF fee income” type with a “reversed payment” on the memo. It’s very important that reports are sent to operations director and the president each week showing the outstanding balances along with the status of tenant evictions, notices given, WRIT dates, payment agreements, etc. On the 3rd of each month, tenants that have not paid should have a friendly reminder sent to them that their rent is late and that they’ll receive late fees soon. On the 4th, 3 day notices should be sent. Even if it’s a “good” tenant that we’re “positive” will pay. You’re free to tell them that we know they’ll pay, it’s just a formality/policy. After 3 days has expired, an eviction must be done. Anyone we don’t file on after a 3 day notice needs to be approved by the operations manager along with an explanation of why we’re not going to file. Rather than my coming up with a way spreadsheet that you can fill it, it will save you a lot of time if you use the built in xls that Buildium can generate. Simply go to REPORTS then DELINQUENT TENANTS. Save as .XLS (rather than .PDF). If you go to BOX.com under “FORMS” you’ll see the “Delinquent Tenants” sample .xls. It’s pretty much the “stock” report I just ran for 1624 Holman but I changed the 0-30 day, 30-60 day, etc. rows into a spot for info such as “file date”, “3 day date”, notes, etc. JOB DUTY: New updates will be due EVERY Monday. It’s important to send an update even if the Monday falls at the start of the month. UPDATES SHOULD COME IN THE FORM OF ADDING A NEW TAB TO LAST MONTHS xls FILE AND EMAILED TO OPERATIONS. Reason being is there will still (likely) be applicable notes from people that have past due balances that are from the previous month. Here is an example of what would need to be provided. If someone is late, we’ll expect to see some notes in terms of what we’ve done or what they’ve committed to. Tenants who have not paid and we’ve taken no action on will reflect poorly on the property manager. IMPORTANT NOTE: All tenants we file evictions on must have a $125 eviction fee added to their ledger and a $150 WRIT fee. This fee is put on by the manager. Make sure Buildium has current photos of properties and all properties are listed. Make sure all listings are on Craigslist, HAR and others you feel fit. BODY must contain FP/LLC to make it easier to find for CEO and Operations who will audit twice a week. MUST POST EVERY OTHER DAY! Keep a Leads Log to be audited by operations to make sure everyone is being contacted who is interested in an apartment. Keep accurate records of who’s been leased for the purposes of commissions via an XLS. Go over and fill out lease with tenant based on standard lease terms defined by Fat Property. (12 months) (Would rather this be done via docusign vs. printing and signing leases. Hand Move In Packet with keys to tenant on move in day. Make sure they’ve read and understood everything in the packet. Make sure they have SUCCESSFULLY moved in. Make sure MARKET RENT is updated in Buildium. OPERATIONS: Will audit property postings, leases in buildium, and leads log. Process if able to show and apartment is available. If not available suggest another apartment and show. If no apartment available then do not process. I know we can get busy and bombarded with calls from potential tenants. IF the leasing manager can’t get to all the calls or showing there are other people in the office that should be able to help. Data Entry can help with call backs. If they find there is someone who is truly interested you can set up a meeting for the PROPERTY MANAGER to show it or OPERATIONS . THEY TOO GET COMMISSION. ONLY show if they come to the office or are at the PROPERTY. Therefore, don’t EVER leave the office to meet a tenant unless they call from the PROPERTY. We could also REQUIRE them to apply online FIRST. Send them to www.fatproperty.com/apply. THEY ARE ONLY CHARGED IF APPROVED. Remember we will now be enforcing the APPLICATION policy. WE NOW REQUIRE applications to be ON FILE alone with their lease. This too will be audited. Commission is paid after tenant has lived in their apartment and have paid a full months rent. In order for this commission to be “safe”/valid the tenant must have paid 4 months rent. Property Managers also get incentives for leasing with the same conditions stated above. *Incentives will not be the same amount as Leasing Manager. To be handled by Property Managers if not available then Operations to handle. Tenant to receive CREDIT on their ledger. NEVER TO RECEIVE CASH OR CHECK. This to be done by ACCOUNTING/OPERATIONS. Charged to COMMISSIONS. Disconnect call forwarding to our answering service and answer phones. 2) “We’ll get right on that” – keep as active, then change to “COMPLETED” when completed. Never DEFER anything unless it’s something we will be doing at a LATER time. Filing and loading laundry cards. Connect call forwarding to our answering service before leaving at end of day. All bills paid (“ABP”), for the most part, simply means we pay for electricity in addition to the other bills normally paid by the owner already (such as water, trash, etc.). Typically a building is ABP because there is one master meter for electricity. As such, tenants don’t have the ability to put electricity into their own name. On those property, gas (if applicable) is also in the company name as one big meter. Below is an alphabetical list of properties and information if they’re ABP or not. And what utilities, if any, a tenant needs to put in their name. Note that none of our ABP buildings include cable TV. Colquitt: ABP Property. We pay electric/water/wifi/trash. Hawthorne: Not ABP. Tenants pay for electric and gas (if at the property). We do, however, pay water. Holman: ABP Property. We pay electric/water/gas/wifi/trash. Jalna: Not ABP. Tenants pay for electric and gas (if at the property). We do, however, pay water. Marshall (1424): Not ABP. Tenants pay for electric and gas (if at the property). We do, however, pay water. Richmond: Colquitt: ABP Property. We pay electric/water/wifi/trash. Southmore (2412): Not ABP. Tenants pay for electric and gas, which are individually metered. We do, however, pay water. Tierwester: Not ABP. Tenants pay for electric and gas (if at the property). We do, however, pay water. Truxillo (both): Not ABP. Tenants pay for electric and gas (if at the property). We do, however, pay water. Tuam: Not ABP. Tenants pay for electric and gas (if at the property). We do, however, pay water. W. Alabama (502): ABP Property. We pay electric/water/wifi/trash. W. Alabama (fourplexes): Not ABP. Tenants pay for electric and gas (if at the property). We do, however, pay water. Wipprecht: Not ABP. Tenants pay for electric and gas (if at the property). We do, however, pay water. There is to be no “deals” where we offer an ABP option on a non ABP property. From time to time I’ve listed our ABP properties for $100 less than true market rent, with a note that we have an ABP option for $100. However, it’s not truly an option as it’s an ABP property, and it’s not something we’d advertise as offering on a non ABP property. The reason I’ll list (or advice we list) ABP properties for $100 less then note the additional cost of utilities is because often someone will have $750 they can spend total on rent + utilities, so they’ll look for places that might be $650. If we have a $750 “ABP” property, they’ll never find ours (or will skip it) since they’ll think they’re going to need to budget utility payments on top of that. So by listing at $650 and noting a $100 ABP option (again, I use the term “option” loosely), you target people who are fine to spend $750/month on an ABP property that may not have found you if it was listed as $750 ABP (if that doesn’t make sense, let me know). 1) Post notice of Lien on door. (OPTIONAL) This form can be found HERE: NOTICE CONTRACTUAL LIEN (blank) This form states how much is OWED and if not paid we have the right to take NON EXEMPT belongings. 2) Perform Contractual Lien CORRECTLY. Meaning: Document what is taken, don’t take the wrong things, leave note of what was taken and where to pick up. 4) Follow process with their belongings per Lien. Hold for 30 days, sell, let tenant know what we got from the sell and what their balance/credit is. 5) Contractual Liens can be done at ANY TIME. Preferably these will be done after placing a 3 days notice of eviction and not receiving payment or after being 7 days late and owing more than $400-$500. REMEMBER: You can not take more than they owe. Managing standard rent collection procedures, outstanding balance reporting and contractual lien procedures. Administer procedures for tenant move-ins and move-outs and ensure sites are always in a state of tour-readiness. Manage vendor management and contract negotiation standards. Conduct routine property inspections, develop site compliance programs, conduct audits and set performance standards for site operations. Monitor, analyze and address potential operational and resource risk areas for the Company. Support Managers on problem solving and management decisions, ensuring that Company standards, policies and procedures are implemented, and confirming that Property Managers comply with all local and regulatory requirements. Audit Craiglist/HAR postings twice a week. These post should be made every other day. Work in tandem with Sales and Customer Service to support sales proposal preparation and incident escalation/resolution as necessary. 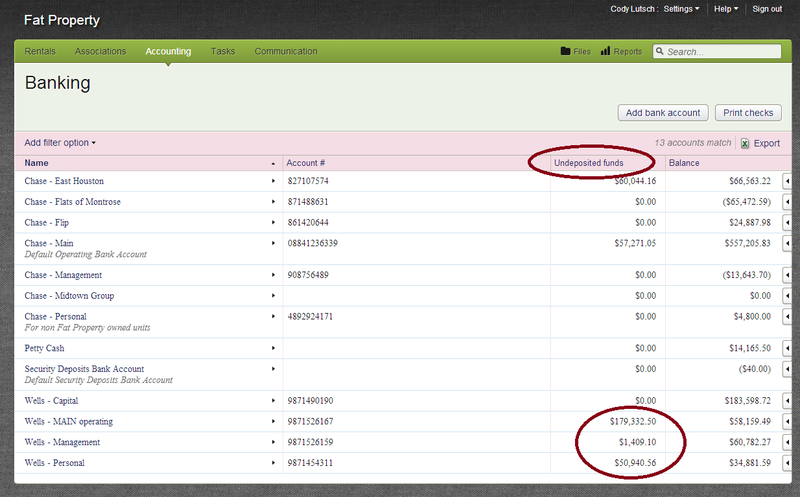 EFT payment made at the end of the month in Buildium may not show up till the start of the next month on bank ledger. Sadly, the EFT payment date in Buildium can not be adjusted (and obviously the date it was funded in the bank can not be adjusted. So while the bank will often have a deposit at the start of the month that doesn’t have a Buildium matching deposit, likewise Buildium will have a deposit at the end of the month that won’t show up on the bank end. 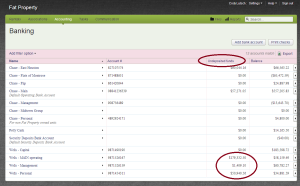 Property managers doing a deposit of $x (as recorded in Buildium) while a true deposit of $y was recorded at the bank. There are a few things that cause this: A property manager may record two deposits in buildium ($a and $b) then put one deposit ($c [where $c = $a+$b]) in the bank. While petty, and while this will make the bank and buildium have the same total, the two deposits ($a and $b) need to be deleted in Buildium. This will ‘free up’ the received funds so that they can be selected all together and redeposited as a group to match what really occuured. Make sure when doing this to change the deposit date to match when it was deposited (as buidium will default to having the deposit date be today’s date). Reoccurring charges auto set in buildium that are no longer applicable will show up on the Buildium side but not the bank side. When these are found, they should be removed or adjusted. This should only be done after talking with Cody or Operations to make sure that the reoccurring charge in Buildium doesn’t reflect a payment that SHOULD have come out of the bank that didn’t. A Buildium charge not reflected in the bank is often a sign that we’ve not sent a payment we should. Finally, items that cause Buildium not to match bank account are often vendor charges that are were simply put into buidlium incorrectly or left off when trying to add charges from the bank account statement. Once a month matches, I’d put a paper copy in a folder labeled “month – year” and staple a copy of a print of the banks monthly transactions along with a buildium list of transactions. This should be done for each bank account. Vendor Bills: In the shared drive under accounting files is a folder called “Vendors”, inside it’s broken into vendor type (i.e., “Water”, “Gas”, etc.). Each month, the accountant should log into the vendor page and download a pdf copy of all invoices. They should be saved in the share with a common naming scheme (see the existing files in the share as an example). The .pdf of the vendor bill should be attached to the accounting entry in Buildium. Tip: When I’d do reconciliation, I’d have my bank print out of all charges. There would be several labeled simply “Water company”. I’d go to the water company site, download all the bills for the month and save them in the share. The file names would contain the bill amount. I’d then write on the bank print out what charges belonged to what property. This would allow me to quickly put the bills into Buildium from the bank statement. Tip #2: All reoccurring charges should be in Buildium already for predictable things like mortgages. However, just because utility charges are not a fixed amount doesn’t mean you can’t setup reoccurring charges. Here is a major time saver… Set reoccurring charges in the system for each utility vendor to take place on the approximate date of the month we are charged. Set the amount to be $1. Now, each month when you reconcile, all you need to do is change the $1 to the real amount and attach the bill. That’s a major time saver each month vs. putting in a new ‘record check’ where you have to select the vendor, the type, the property, etc. Back to recording materials and labor to properties: Many charges in the bank are easy to peg to a property: The gas bill for building A, or the mortgage payment for building B. But what about a Home Depot receipt for $x? At this point, I don’t know how we could be 100% accurate in dividing up our materials receipts in terms of billing to the correct properties. I have some ideas but they haven’t been implemented. One would be to have a PO# tied to each purchase request so it could be tied to a property. However, often times materials are bought for stock or items for many properties are bought on one ticket. The goal is to come as close as we can. “ACH”: This is used for bills that are auto deducted from our bank account. This is normally utilltiy bills. We’ll setup utility bills to be auto drafted as the amount is different every month, making it impossible to setup an auto bill pay. “Online”: For any single payment made via a website. example: You log into the credit card company website to make a single payment. Nothing can be bought without it being in a task with a PO#. Receipts must be kept and turned in with card. Receipts must have PO# on them. In Buildium will be “to be sorted” until receipts are turned in and able to organize. Find operations if you need help with this. All payments to liabilities should be labeled as mortgage interest. Once a quarter a $0 check will be done to correctly categorize the mortgage principle that’s been paid. Done by giving cost back to interest, and crediting the loan in chart of accounts. This must be done every quarter. Management fee’s, Operations fee’s and True Company Costs must be charged to each property that isn’t already being charged a management fee from us. Run a report of Income Statement Detailed and find COMPANY EXPENSES TOTAL, ADMIN PAYROLL TOTAL and MANAGEMENT TOTAL. To find the percentage that each property should get charged you divide the Rent Paid (Of that particular property) by Grand Total (after adjustments). Do the same for $of Management and $ of Company Costs. 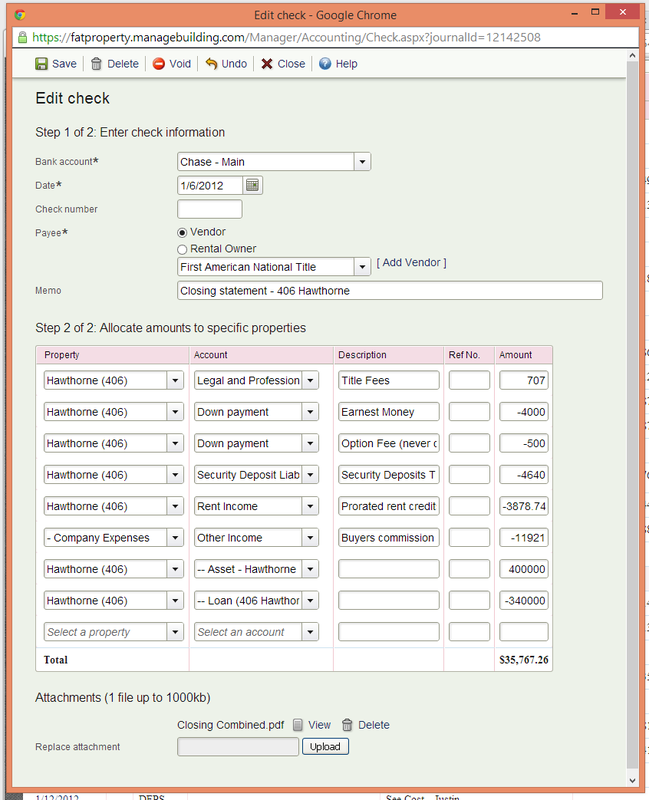 You can find previous Cost Disbursement in Accounting file. STATS TO TRACK: The accountant should be running these reports to go over with Operations and CEO 1st Monday of the month. This will help us understand the POTENTIAL collection figure from our properties, and what our actual rent roll is as a % of that. Track to make sure we’re going in the right direction. This should be done EVERY MONTH for the PREVIOUS month. Run report to show properties and their % of rent income and the % of management cost that gets applied. Once template is created easy to paste new data. What we can see: Our reoccurring charges of $15,255 was about 85% of market rent roll potential. Our collected rent was 95% of reoccurring charges and 81% of market potential. On the spreadsheet, you should also summarize the real $ vs. just %’s. Using Colquitt, that means reoccurring charges were $2,625 less than market. Collected was $740 less than reoccurring and $3,365 less than market. All properties / invoices after 6-13 should be under the various “Wells” accounts. If they are “regular” buildings owned by Fat Property, they’ll be under “MAIN Operating”. If they are single family homes owned by Cody (i.e., “Sassafras”, 204 Marshall, Brookdale, Misty Cove, Persidio, et.c), they will be under “Wells – Personal”. If they are properties that are managed, but not owned, by Fat Property, they’ll be under “Wells – Management” (i.e., “Bryan/Brady”, Tierwester, 1850/1854 W. Main, 1424 Marhshall, etc.) Update: As of mid 12/2013, all properties owned or managed, that used to fall under the “Wells – Management” account are now under the “MAIN Operating” account. This was done to help clear up some confusion among property managers and stress the idea that each property needs to be treated as it’s own entity from an accounting perspective — i.e., all bills for labor/materials need to be assigned to a particular property. 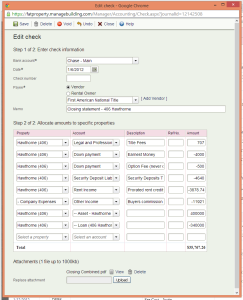 Accounting for bills that include deposits: Under “Chart of accounts” I created a new “Asset” type called “Deposit paid”. Whenever we pay a deposit of any type that we expect to get paid back, put it under that type. FOR OPERATIONS AND ACCOUNTING: NOTHING is to EVER be spent out of “Capital” unless it is a large capital purchase of $2000 or more.. If there is a payment that needs to be made out of “main” and the account doesn’t have sufficient funds then do a loan from capital to main (after asking me) then write the check from Main. This should be categorized as “Loan Paid” in buildium under the account it came from and “Loan Received” under the bank account it went to. Likewise, there should be no capital purchase made out of main. i.e., if we ever have single large orders from Home Depot or AJ Madison or whatever that are for big capital spends (big appliance orders, big cabinet orders, etc.) then make those directly out of capital. UNDEPOSITED FUNDS: It’s up to operations (or accountant if applicable) to keep an eye on “Undeposited funds”. There should never be an instance where funds are collected and not deposited within 2 business day. See below (click for full size). This isn’t an acceptable scenario. The “Property” is going to be the subject property. I recorded all the misc title fees together under legal and professional. I have the “down payment” on there as a negative as it was a credit back to us at closing from a check we already wrote (which will then $0 out the “down payment” from a balance sheet perspective). Same with option fee. There is a line for security deposit liability. This is because we’re getting credit for the liabilities we’re not assuming. Ditto the prorated rent. On this example, the COMPANY is making a commission (thus “Company expense” is selected). Since this is a check, negative items actual fund those accounts. Finally the property is on there as a asset (based on purchase price) and the loan is on there as a liability (based on loan amount). The grand total if we did this right should = the check that was given to the title company. Property Manager call Rex Plumbing for emergency dispatch to investigate leak and clear blockage to discover cause of sewage leak. Property Manager notify tenants to avoid area and use of plumbing if possible until repairs can be completed. Remove contaminated water from top soil or surface affected. If top soil effected remove 1” layer of soil, bag and dispose. 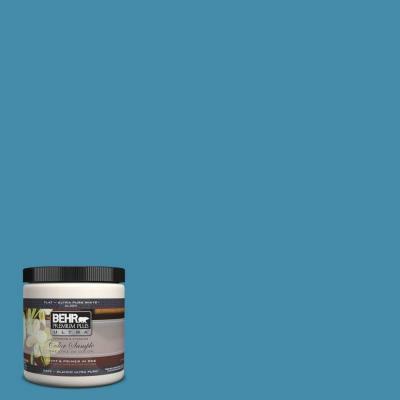 Apply Lyme to affected area to kill bacteria. If contaminated water reaches storm drains call SWS for emergency clean out of affected area. You may purchase your own ac unit or space heater which we will credit you for up to $150 on your next rental income. If it remains in the unit at the end of your lease you will be credited the full amount up to $300. We are ordering several space heaters into the office and you are more than welcome to pick one up. This MUST remain in the unit after lease termination or you will be charged the full price of the heater and a fee.